The perfect example of a great mid range wrist computer. 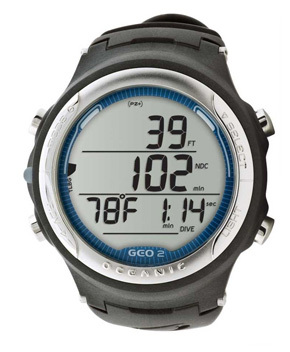 The Oceanic Geo 2 dive computer has a redesigned screen with all the essential info easy to read with large numerical displays, despite the overall compact size. This is an ideal computer for anyone looking for an upgrade or a beginner with a little bit higher budget than an entry level dive computer like the Cressi Leonardo. The Oceanic Geo 2 Supports both air and 2 programmable nitrox gas mixes, one up to 100% O2. The main screen is easy to read with just the most important info offered (Depth, NDL, BT and a N2-loading bar graph). The audio alarms are accompanied by a small flashing LED which we found to be a nice touch. 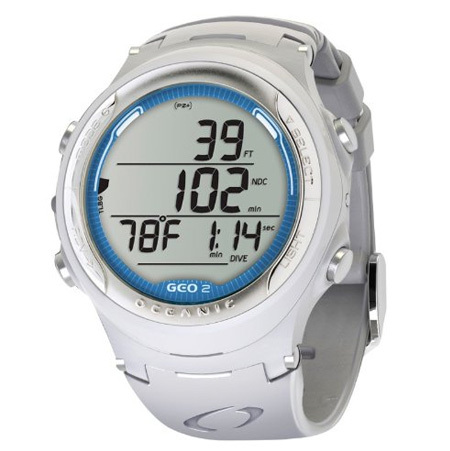 The Oceanic Geo 2 dive computer has 4 operating modes: Watch, Norm (for air and nitrox), Gauge (with run timer) and a free diving mode, which is a nice added feature. Navigating the menus is super easy thanks to their step back system and it only took us several minutes of hands on time to become familiar with all the various functions. The backlight works great for low light situations like night diving and is reasonably powerful and has an adjustable duration. The only drawback with the display is that the bar graphs are quite small and can blend into the background slightly. The safety stop countdown timer kicks in for the 3 minute mark and is a handy addition for the end of your dive. The small, sleek design looks great as a daily watch. Oceanic Geo 2 dive computer has memory for 24 on unit dive logs which is more than enough for most divers, but you can also transfer the data to a PC with the optional USB transfer Kit. 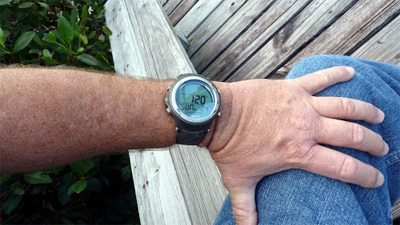 You can also quickly reference your last dive with their added “last dive” function. Visually the design is quite sharp, and given the compact size it looks great as a watch. As a scuba diver it can be fun to proudly display your dive computer for those in the know. Other divers will certainly notice and it’s a great conversation starter while travelling. The team here at scuba diving dreams was pleasantly surprised at the build quality and the surface materials are nicely durable. This dive computer should last you a long time. One drawback was the user manual which was pretty convoluted, but it’s so user friendly we were able to become familiar with it after several minutes of use. Overall this is one of the best dive computers in the beginner-intermediate price range on the market today. Thanks for taking the time to read our Oceanic geo 2 Dive Computer review, and hopefully you found it helpful. We highly recommend this to anyone looking to upgrade from a basic dive computer or a beginner with a higher budget. If the Oceanic geo 2 wrist computer had air integration included it would be hands down our #1 recommended mid range dive computer, but given the price point it’s understandable.